These are medium-size bibs (about 7” across at its widest point), good for small infants or as spit-up bibs. Now we are making the sides of the bib. We will make each side individually. Flip bib over. Reattach MC yarn to the other end of Row 23. Repeat Rows 24-36 on this side. Edging and ties: Attach contrasting color in Row 36 of Side #2. Chain 35. Slip stitch in each chain (making tie #1). Slip stitch back into Row 36. ch 1. sc evenly down inside of Side #2, across front of bib, and up the inside of Side #1. When you reach Row 36 of side #1 (the top), Chain 35. Slip stitch in each chain (making tie #2). Slip stitch back into Row 36. ch 1. sc evenly around the outer edge of the bib. When you get back to Row 36 of Side #2 (where you joined the CC), join to first sc. Fasten off. I have trouble when I get to the tog. Help please. Right here is where I get confused. tog is together as I remember. is that in the same chain? Yes, tog means together. What you're doing is decreasing at the beginning of the row. In Row 24, you should have only sc'd in the first 7 stitches, then ch 1 & turn (to start Row 25). At the beginning of row 25, you'll decrease one stitch by sc the first two stitches together, then sc regularly in the remaining 5 stitches. You'll continue to decrease at the beginning of each ODD row by sc'ing the first two stitches together, until you end up at Row 35 with only one stitch remaining. This should give you a slanting line on the inside neckline of the bib. Let me know if that helped!! THANK YOU SO MUCH!!!! I make baby blankets for our local NICU. I LOVE your pattern. I want to make some of these for the NICU babies. Thanks again for helping me out. Have a blessed weekend! What an awesome pattern! I love it, and it's so simple to make! I have made a bunch now for my little niece. She'll look so adorable! Just in time for a new baby, already here. And 3 due at the first of the year. Thanks so much for sharing!! Love the pattern the bibs are so pretty and useful. I am sure the babies and their moms will love them. Love this pattern! Thank you. Thank you a million times over for sharing this pattern! I had envisioned the same thing in my head, but cannot design patterns. I changed it a bit for newborns. I used a G hook and only crocheted a total of 19 rows (which includes the Foundation Row) before I started the neckline rows. They came out adorable! 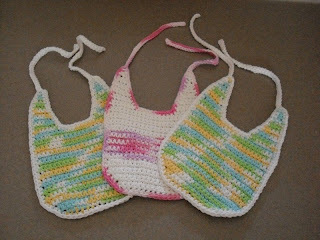 For adorable newborn bibs, I used a G hook and crocheted a total of only 19 rows, which includes the Foundation row. Then I followed the rest of the pattern to make the neckline. I was able to make 3 bibs from a 2.5 oz skein of Sugar n' Cream cotton yarn and used variegated scraps for the trim. Quick & easy - made one in an evening! Thank you so much for sharing this pattern! I just completed 7 different bibs x2 for a friend expecting twins! Such fun making them! I read Post and got it fine and informative. Please share more like that. I love knitting and crocheting, especially for charity. Sometimes, though, I just can't find the "right" pattern for a project. So, what do I do? Come up with one myself! I hope you enjoy using my patterns as much as I enjoyed creating them. Boxes of Yarn in the Mail! You are welcome to print this pattern for personal use. You may link to this page, but please do not copy the pattern source to another web page. Items produced from my patterns are for personal or charitable use only. My patterns or items made from my patterns may not be sold, reproduced, or put into kits without my written permission. Thank you!